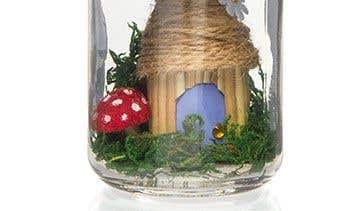 Design your own enchanted woodland scene in a jar with a fairy house and miniature toadstools. 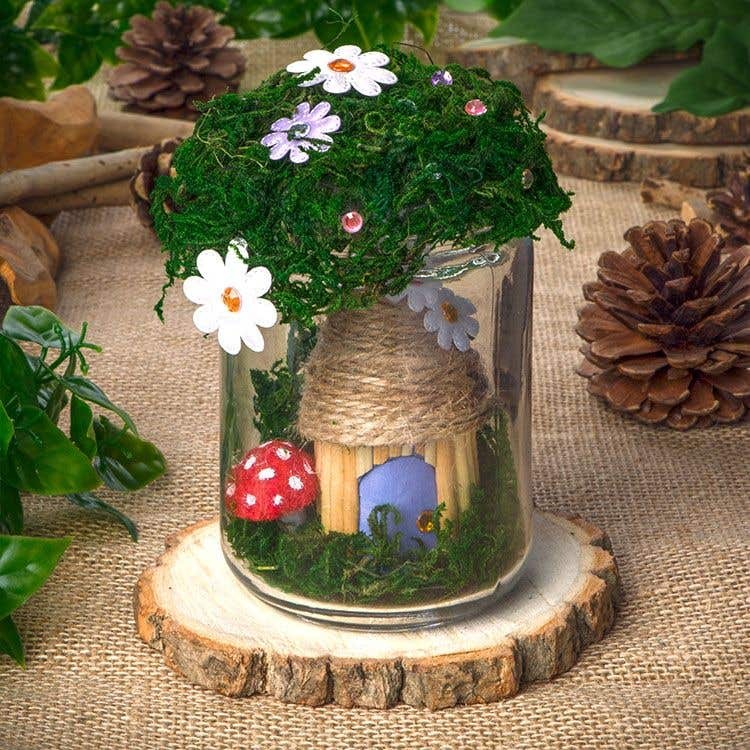 Dried moss, flowers and gems can be added as decoration onto the jar lid. For the house, cut out a strip of coloured card 4cm x 12cm. Draw a door with an arched top in the middle of the strip. Cut 3 straws into 4cm lengths. Carefully split each piece of straw down the middle using a craft knife. Glue the straw pieces along the card strip, leaving 1cm at the end. Cut shorter straw pieces to go above the door. Leave to dry then tape the strip into a tube shape for the bottom section of the house. For the roof, cut a 12cm diameter semi-circle from thin card. Draw round a large roll of sticky tape as a circle guide or use a compass. Tape the card into a cone shape. Brush glue over the cone then starting from the top, wind some twine all the way down until the card is covered. Leave to dry then glue the roof onto the bottom of the house. For the toadstool, cut a felt ball in half with sharp scissors or a craft knife. Roll up a 2cm x 6cm strip of white card for the stalk, glue along the edge to hold the stalk shape then glue it onto the flat side of the felt ball. Leave to dry. Paint white dots on the top. Brush glue around the base of the house, stick down the mushroom and some dried moss. Brush glue onto the jar lid then press dried moss over the top. 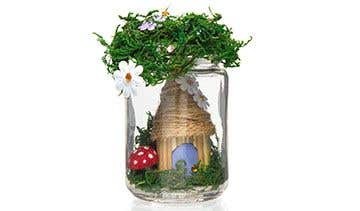 To finish the fairy house, stick some satin gem flowers onto the roof. 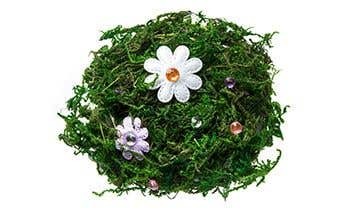 Add flowers and gems to the moss on the jar lid and around the base of the house. If you leave glue for a few minutes to become tacky its easier to glue the pieces together.